“Fundamentals” will be a biennale of Optimism, celebrating “the richness of architecture’s fundamental repertoire” over the last 100 years. The exhibition will explore the ways that Australian residential architecture has evolved from 1914 as a specific response to and celebration of light, climate and environment as a fundamental aspect of design. The brief suggests that “architectures that were once specific and local have become interchangeable and global.” The Australian context challenges the notion that national identity has been sacrificed to modernity. Early Australian architecture was heavily influenced by global typologies and has instead evolved national characteristics in its fundamental response to its environment, whilst embracing the modern architectural language. The exhibition will draw on specific Australian examples from the outback to the suburbs to the city. Absorbing Modernity is well illustrated in the Australian architectural context with the treatment of light and the response to environmental design. Starting with a transposition of English, European and American typologies, Australian architecture has become increasingly sensitive and responsive to the specificity of light and climate. The once specific and conventional, colonial architecture, has developed into a rich, complex array of treatment of light. Buoyed by new technology and materials, the 1920s and 30s saw the beginnings of the European modern movement with the introduction of “international” styles emphasising function. Although initially considered radical, Modernism had largely supplanted historicism by 1950, and in Australia, the style developed strong regional characteristics, particularly in its domestic form. Modern architecture was typically site responsive and broke down divisions between the interior and exterior. The notion that buildings should be carefully considered in relation to their context and environment has only advanced in the latter part of the 20th century. Light and the environment had a defining impact on architecture, modifying the relationship between inside and outside. Architectural design has radically changed in the past 100 years, from enclosed, introverted and rejecting the surrounding environment in 1914, to open, extraverted and embracing the external environment in 2014. The exhibition will document architectural responses to light and the environment as a fundamental aspect of design, drawing on specific examples across the period 1914-2014: from the ubiquitous bungalow to the “Great Australian Dream”, the iconic Queenslander and post-war modern ‘homes in the sun’. The exhibition will also celebrate dynamic contemporary architecture, including indigenous architecture, fusing modern residential requirements with traditional influences and identity. Further development of the theme in a second stage may refine the focus of the exhibition: one suggestion is to focus on windows or the wall plane that mediates between inside and outside. Much of Australian architecture evolves in small to medium size practices and this biennale is an opportunity to include innovative and dynamic projects from these practices. 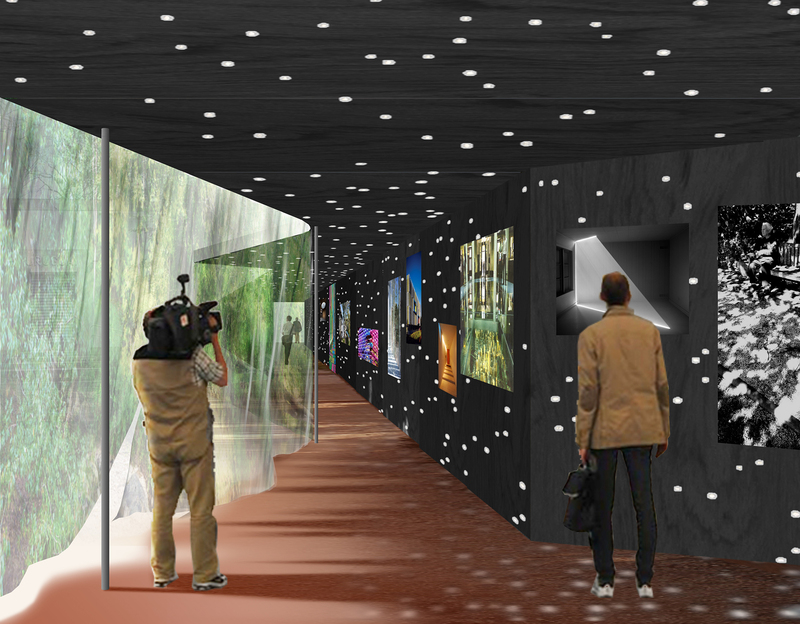 Like the 2010 biennale, it will be an inclusive exhibition through consultation with contributions from various practices illustrating their interpretation of the treatment of light and consequentially the environment. The Australian Exhibition will be well defined to evoke intrigue whilst ensuring, homogeneity, continuity and clarity of content. Paradoxically, the absence of a pavilion this year gives great opportunity for the display of the exhibition to break free of the pavilion. Like the Serpentine Pavilion in London, it is a chance to create a space which is purpose-built for this exhibition; not constrained by the volume and atmosphere of national pavilions. 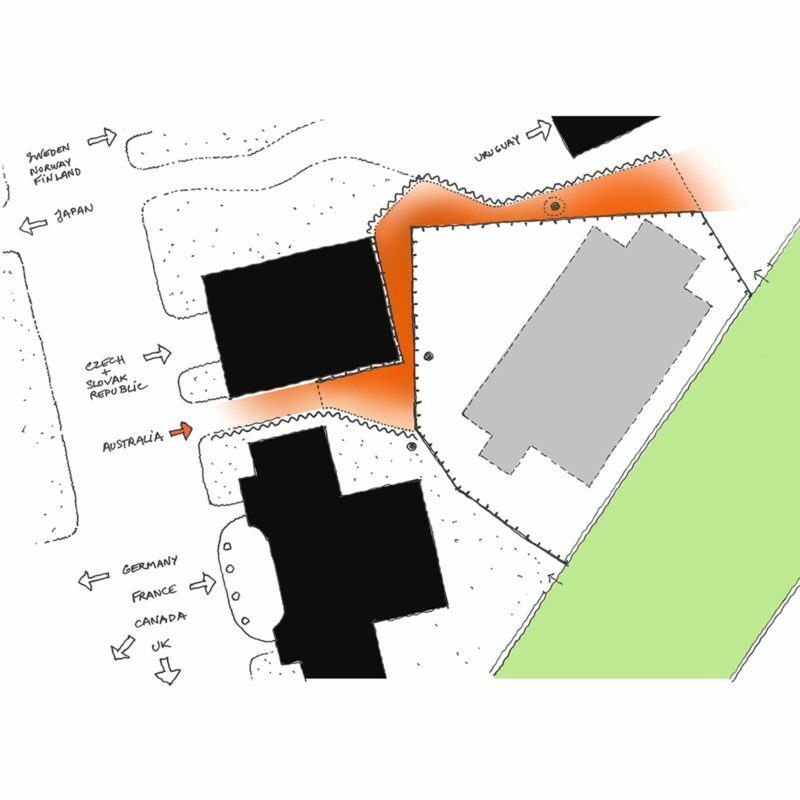 This proposal takes the idea of the construction site hoarding, suggested in the briefing document, and extends it create something quite fantastic. The extent of exhibition will need to respond the budget and construction constraints. Ideally, the exhibition will reach out to the main avenue between the Czech and French Pavilions but it could be shortened to the area next to the Uruguayan Pavilion. Refer to the plan. Visitors to the architecture biennale are bombarded with content of all manner of media during their visit. It is paramount that the display and its content are engaging and accessible to all visitors. It is proposed that the exhibition material be mounted on the construction hoarding with a roof added for weather protection. Ideally construction of the hoarding will be coordinated with the biennale exhibition to create a sinuous exhibition space. The theme is suited to a display that starts in 1914 and progresses to 2014 as the story of light unfolds. Another aim for the exhibition will be for a colourful and relaxed atmosphere. 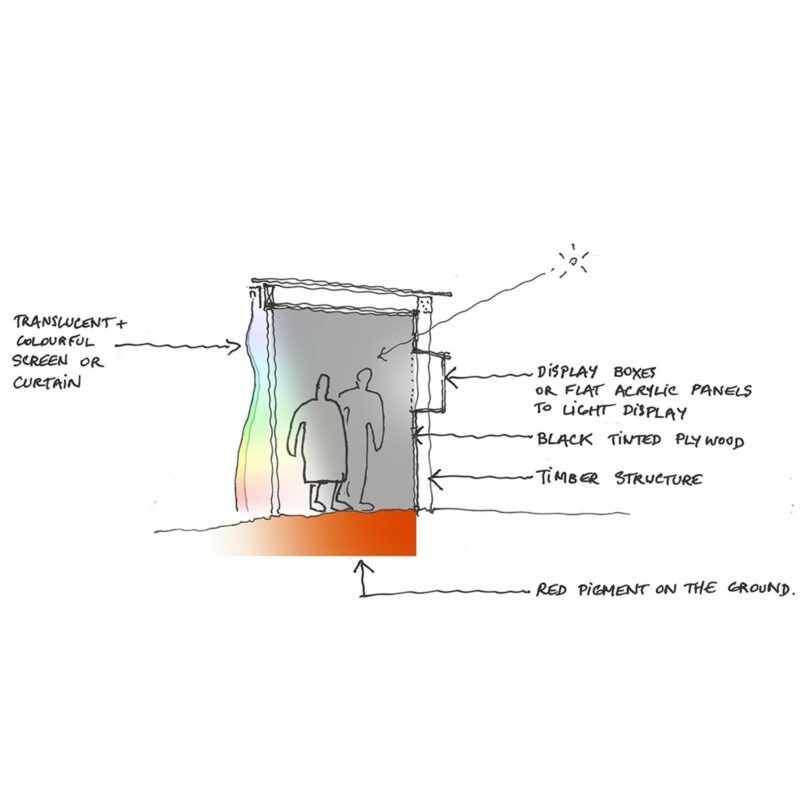 The design of the display echoes the theme of this proposal: the treatment of light. The sinuous side of the exhibition is enclosed with a transparent / translucent / opaque / curtain or another screen types that is printed with relevant images. The images modify the penetration of light into the space with different colours and intensity. Occasional holes in the solid wall hoarding or even the roof are cut out to create another quality of light. The curtain or screen may be quite dark or even opaque to allow projection, it will have breaks in it to allow visitors to come and go as well as ventilate the space. It will also open to accommodate functions such as the opening. Images and possibly other media such as small models will be mounted on the construction hoarding and back lit. Peep holes may reveal the construction behind or look into a diorama. The ground plane may be treated with a red pigment that evokes Australia. Refer to the image. The aim for the touring exhibition is to make it a “flat-pack” freight package consisting of images, small models or projection. The exhibition has the potential to be toured to many venues either internal or external; internally it will be a fitout while externally the exhibition will either need a new hoarding or it may be possible to use an existing hoarding with modifications. The simplicity of construction is important for it to be packed to a compact size: the curtain is rolled up in sections for transportation and re-erect on a new site. We do not imagine that hoarding will be transported.